Alcuin offers a variety of after school classes for our students. Children can choose from piano, ukulele, percussion, chess, Odyssey of the Mind, and art. Our art classes are taught by Alcuin's art teacher, Ms. Sophia, and a variety of sessions are available throughout the school year for children ages 3-12. 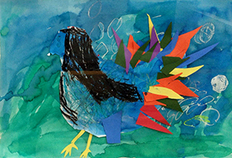 Children will enjoy working with a variety of media and materials in this after school art series. They will explore drawing, painting, sculpture, printmaking and fiber arts in the context of activities that explore a range of world cultures, topics and artists. Does your child enjoy problem solving? Do they love working with their hands? They will enjoy our new Makerspace after school class. Makerspace provide hands-on, creative ways to encourage students to design, experiment, build and invent as they deeply engage in science, engineering and tinkering. Ballet for Children 3-5 and Tappin’ Toes for Children Ages 6-9 Our dance classes classes aim to nurture your child’s creative spirit with instruction in ballet and tap. Children learn the most when they are free to use their imagination and discover their full potential. After school chess is offered in partnership with Chess Scholars. Develop your child’s intellect through the royal game of chess! Current research has shown a strong link between chess and academic performance in a variety of areas,including mathematics and language arts. Also, chess has been proven to enhance motivation, concentration, focus, social skills, and creativity. For ages 6-12. To learn more about Chess Scholars, please visit their webpage. Oak Park's My Music Lessons provides students with private and group music lessons at Alcuin. Instruments offered include guitar, piano, or ukulele, and group piano lessons. All of My Music Lessons teachers have either a university degree, or 20 years of teaching experience. To learn more about My Music Lessons, please visit their webpage.